← Ceres: the Best Place in Space? … is currently about six. That is, if one adds up all the person-years spent in space by various crews, it comes to about six for recent years. In a previous post from 2010, “The Population of Space”, I had been wondering how much time people have actually spent in outer space. I found that no one seems to have added it up. So I put together a single list of all the manned space missions using the Wikipedia article List of Human Spaceflights and merged it with Robert Braeunig’s page Manned Space Flights. From that I was able to generate a list of all the people who have visited space and long they spent on each trip. The results are in the tabs of this spreadsheet, Manned Spaceflight Statistics. From there I was able to boil down the numbers to the charts below. The ISS dominates recent years, of course, but there was a surprising amount of time spent on Shuttle missions in the 1990s, largely because the Shuttle could carry so many people, 7, compared to any other craft. The numbers have dropped a lot in recent years with the retirement of the Shuttle in 2011. 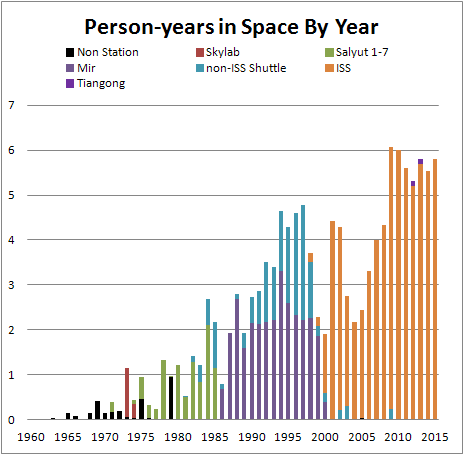 Only about 12 people are going up to the ISS every year, but they’re staying for a lot longer. ISS: The International Space Station, a gigantic station with contributions from the US, Russia, EU, Japan, and Canada. It’s probably the most expensive single object ever built, with a total cost of somewhere near $160 billion. That represents about $2 billion per person-year. Tiangong 1: a small station launched by China in 2011, the first in a future series. Other: all the other various launches, including the suborbital ones by the X-15 and SpaceshipOne, which qualify by getting above 100 km. The ISS has more mass, volume, and person-years than all the other stations combined. The two people with 7 flights are Franklin Chang-Diaz and Jerry Ross. These 5 guys represent only 1% of all astronauts, but 8% of the total person-years in space. There have been 7 space tourists, in the sense of people who paid personally for a trip, or 10 if you also count Senators Jake Garn (flew in 1985), Bill Nelson (1985) and John Glenn (1998), who finagled trips on the Shuttle. Charles Simonyi, a Microsoft exec, went twice. The last tourist was in 2009, so that era may be over. Glenn was also the oldest person ever to visit space, at 77. Gherman Titov was the youngest at 25 in Vostok 2 in 1961. 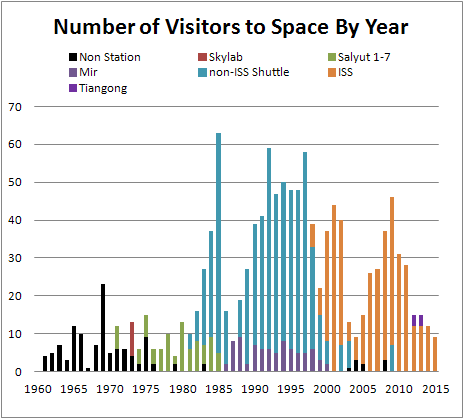 The overall total time spent in space has been declining slightly in recent years, and the number of visitors is way off. This is again largely because of the retirement of the Shuttle. Also, the only manned craft currently able to reach the ISS is the Soyuz, but others are under development. Traffic may pick up if the Chinese ramp up their own stations. The ISS is due to be maintained until at least 2020, and probably 2024. After that pieces of it are likely to be used in the next station. Maybe that will be the one used when assembling the Moon and Mars missions of the 2030s.